Henry IV of Bar (abt 1315–1344) was count of Bar from 1336 to 1344. His aunt, Joan of Bar, Countess of Surrey, governed Bar in his name during his minority. He was the son of Edward I of Bar and his wife Marie of Burgundy. He married Yolande of Dampierre (died 1395),  a granddaughter of Robert III, Count of Flanders. Joan of Bar was a French-English noble. She acted as regent of the County of Bar from 1344 until 1353. Robert III, also called Robert of Béthune and nicknamed The Lion of Flanders, was the Count of Nevers from 1273 and Count of Flanders from 1305 until his death. 1 2 Bubenicek 2002, p. 54-55. 1 2 Bubenicek 2002, p. 67. Edward I, was the Count of Bar from 1302 to his death. He was a minor when he succeeded his father, Henry III, as count so ruled initially under the regency of his uncles, John of Puisaye, Theobald, Bishop of Liège, and Renaud, Bishop of Metz. 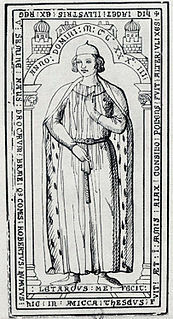 John I of Dreux (1215–1249), Count of Dreux and Braine, was the son of Robert III of Dreux and Annora (Aenor) of Saint-Valéry. Archambaud IX of Bourbon, called "Le Jeune", was a ruler (sire) of Bourbonnais in the modern region of Auvergne, France. Yolande of Dreux (1212–1248) was Duchess of Burgundy as the first wife of Hugh IV of Burgundy. Waleran III of Luxembourg Count of Ligny and Saint Pol, was a French nobleman and soldier. Marie of Namur, also known as Marie de Namur or Maria van Dampierre. Her titles were Gräfin von Vianden, from her first marriage and Dame de Pierrepont, from her second marriage to, Theobald of Bar. Elizabeth of Bar also known as Elisabeth (Isabel) de Bar-Pierrepont, was born circa 1345 at Hagestein, Zeeland, Netherlands. She was the youngest daughter of Theobald de Bar, Seigneur de Pierrepont and his wife Marie de Namur. When her father, Theobald, died between 2 August 1353 and 6 July 1354. And because he had no legitimate male heir, she became the heiress of Bar-Pierrepont. Bubenicek, Michelle (2002). Quand les femmes gouvernent: droit et politique au XIVe siècle:Yolande de Flandre, Droit et politique au XIV siecle. Ecole des Chartes. Michelle Bubenicek is a French medievalist historian. She was appointed director of the École Nationale des Chartes on 1 September 2016.